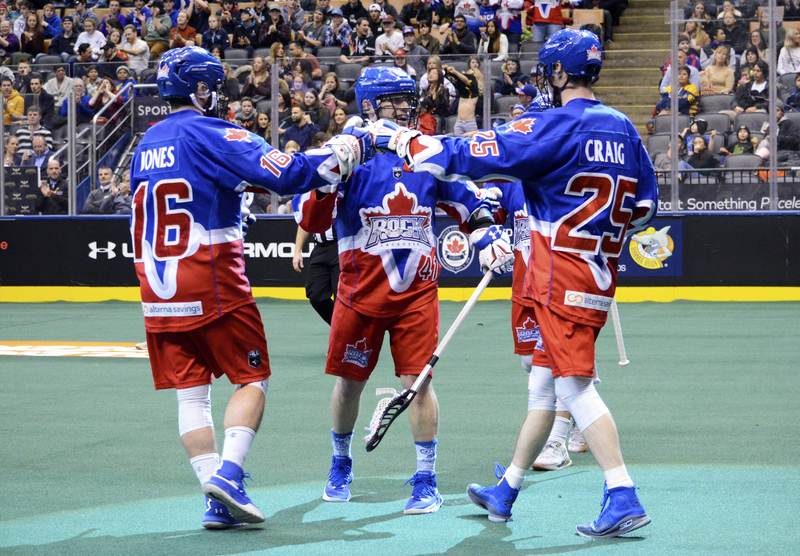 The Toronto Rock have been on a roll as of late winning their last three games and improving to a 4-1 record on the season and a tie for first place in the East Division with the Buffalo Bandits. Meeting for the second time in under 30 days, two Eastern Division heavyweight rivals in the Rock and Georgia Swarm faced off on Friday night at Scotiabank Centre; and this time, finally, it ended with a Rock win. The win showed all the pieces of the team come together to record a commanding 14-9 win over a team that bested them by a single, last-second goal during their December visit. It was the Rock’s first home win against the Swarm since they moved from Minnesota. On the offensive side of the ball, the Rock put their feet on the gas pedal and never let off. Rock bench boss Matt Sawyer’s mantra of “spreading the wealth” has paid dividends. With goals coming from eight different Rock players, the rich depth this club has will become critical late in the season. But, for now, it is entertaining to watch as the club seems to mesh more and more every week. 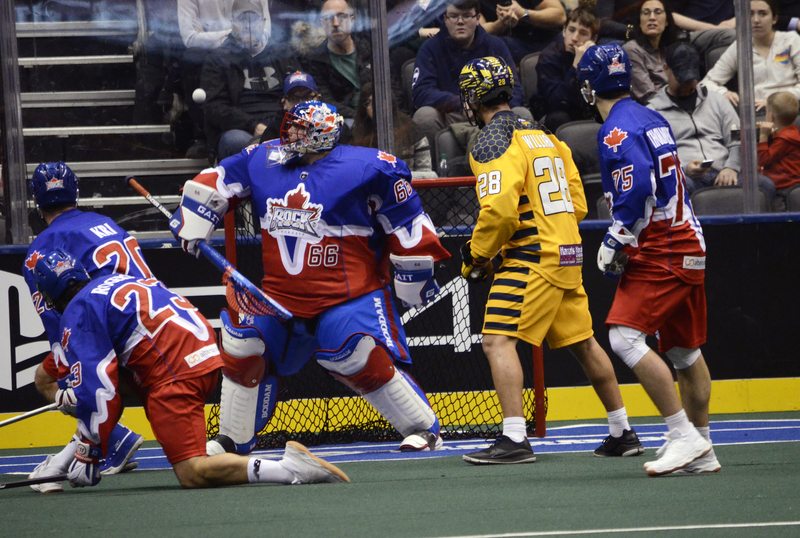 Defensively, the Rock surrendered the fewest number of goals while facing a strong shooting lineup in the Swarm. Lyle Thompson is the face of scoring in the NLL and holding him to three goals on the night, and zero for his brother Miles, the Rock played just as solidly as their name in their end. For the Rock to keep the score a such so highly in their favour, they would have needed yet another memorable performance from their goaltender, Nick Rose. And that is exactly what they got. Steering away 40 balls on 49 shots, the Orangeville native has yet again proven that he deserved his name to be in contention for “Goaltender of the Year” award and perhaps will have a resume impressive enough to claim that title this year. Looking forward to this week, riding high, the Rock square off with their reborn rival in the Philadelphia Wings. Now don’t let Philly’s record make you think that this game is an automatic win for Toronto. At first glance, with a 0-5 record on the season, Philadelphia looks to be in tough. That is, until you look at the stats. Being outscored 46-36, that 10-goal margin has seen the Wings fall short of the win column by just two or fewer goals; losing 17-5 against Buffalo, 13-11 against Georgia, and how can we forget their 11-10 OT loss in Toronto. With one or two tweaks, and once they get one win under their belts, Philadelphia is poised to become a really powerful team and is not one that should be overlooked by the Rock this week as they look to strengthen their hold on first place. For the Rock to be successful, they need to continue to put up the offence. That’s probably a given but in Toronto’s last game against Philly, only three members of the Rock were able to score against Doug Buchan, though they did put up 11 goals. This time they’ll be facing Davide DiRuscio, who has yet to finish a game though has played well in several relief appearances. Testing him early will be key for Sawyer’s team as Philly’s achilles heel is their slow starts.